This event is a LIVE, in-person event featuring a full complement of amazing speakers such as G. Edward Griffin, Ty Bollinger and many others. I'll be joining via Skype video to offer a presentation as well. It runs May 16 - 17, and you can register at HLSregistration.com. The Natural Cancer Prevention Summit is going to be incredibly popular because it focuses on preventing cancer, not treating it. With speakers like Sayer Ji, Dana Ullman, Jeffrey Smith, Bruce Lipton, Michael Murray and Devra Lee Davis (the "scientific truth about cell phones, wireless EMFs and cancer"), this is sure to be a wildly popular summit. 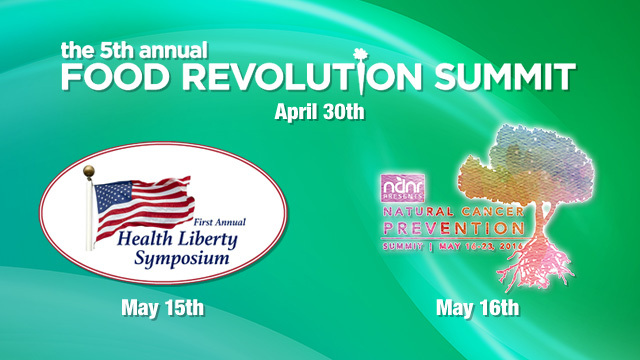 The Food Revolution Summit begins tomorrow! Don't miss the Food Revolution Summit with John and Ocean Robbins. This is a full-on tour de force on healthy eating, food as medicine, nutritional therapies, eating to prevent disease and much more. It features many popular speakers and authors, such as Dr. David Perlmutter, Chris Wark, Marion Nestle (one of my favorites), Ronnie Cummins, Dr. Joel Fuhrman and even Dr. Jane Goodall! This summit is really a who's who of the most brilliant minds of our time when it comes to topics like healthy eating, sustainable agriculture and disease prevention through nutrition. Click here to register now and begin learning as early as tomorrow!